Designing invitations is one of my favorite parts of party planning. June meeting Chip at Fort Wilderness Campground. 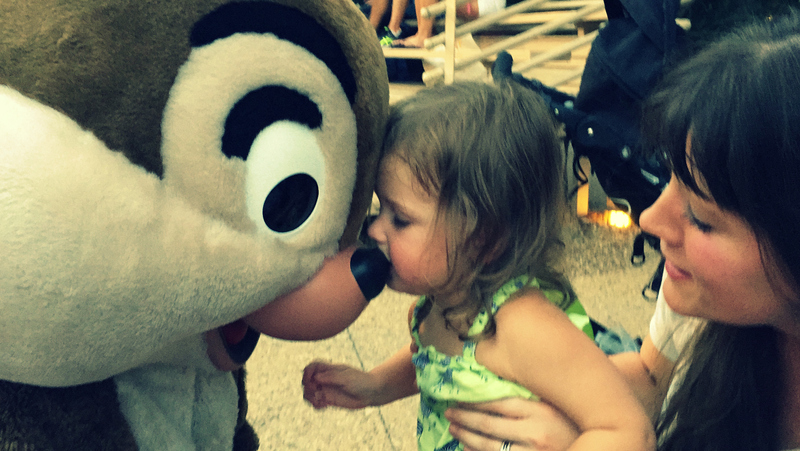 Naturally, we thought it would be fun to do something chipmunk themed for her birthday party this fall. 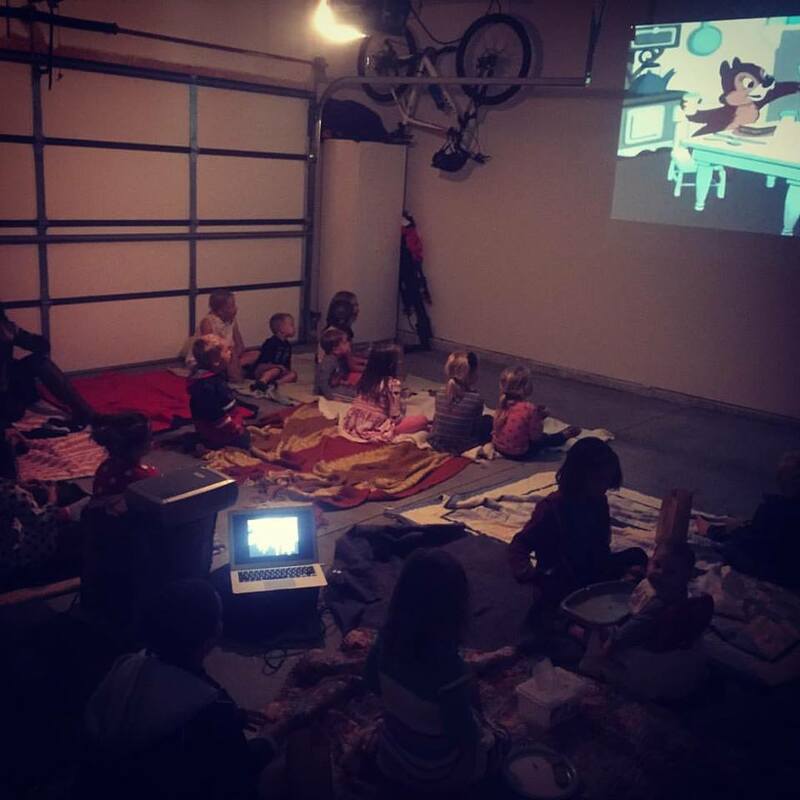 We decided to go totally old school & play a Chip n Dale movie- which we ended up showing in our garage, partially because it wouldn’t be dark enough to show it outside during the day. It was also super fun having it in the garage because we could give the kids bags of peanuts & popcorn and they could make a huge mess and throw the shells on the floor. I love this pic of Juney in the back, taking it all in! We streamed the movie from a Youtube site. There wasn’t much I could find on Pinterest or otherwise for a ChipnDale Birthday, so I kind of just went the acorn route- we have a huge oak tree in our backyard, so for the several weeks leading up to the party, the girls would help collect acorns. It was a fun activity we could do together. 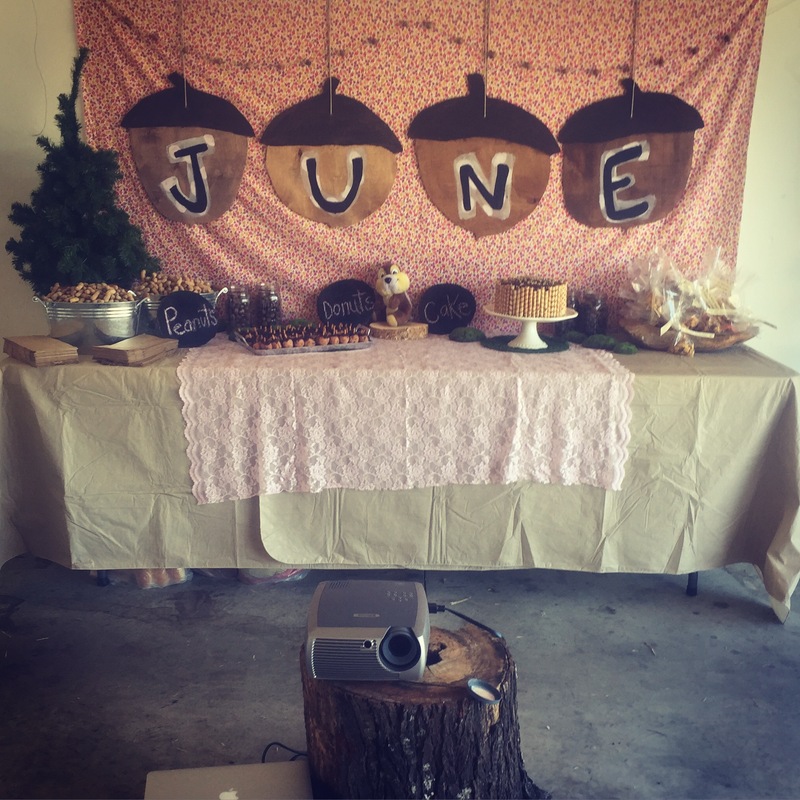 I used those as decor (in mason jars) and also drilled holes through them to make an actual acorn garland. My husband also has a jigsaw and I’m also a huge fan of using old plywood to make cheap decorations that can add a really fun look (we did this for their nursery rhyme party too)- so he helped me make some giant acorns for a backdrop. I kind of recycle decorations & use them again in different ways. Some of this was just leftover from June’s Junebug party. Plus or minus a few tree stumps & hay bales. I also really love involving the kids in making decorations, so a neighbor friend came over and taught us how to felt acorns for another garland, which we hung over the garage. I didn’t take many good pictures during the actual party, so this is Juney the morning after with what I refer to as PPD, post party depression. 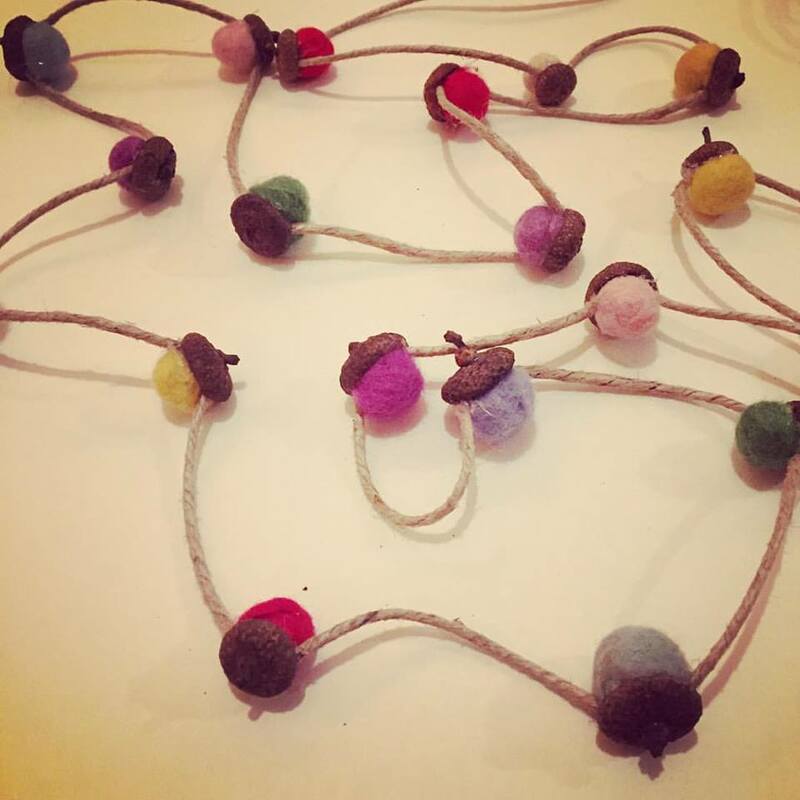 But if you look closely, you can see the felt acorn garland. I wish I’d taken more pics of the food table outside. 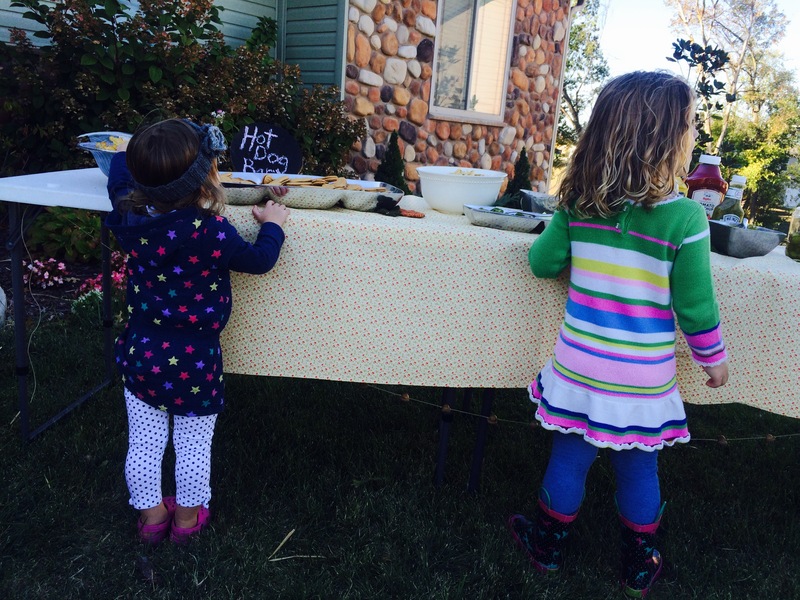 We did a hot dog bar with condiments & toppings like sweet pickles, dill pickles, onions, jalapeños & chill. We also had banana chips and nutter butter cookies. Pearl & June reaching for some nutter butters. 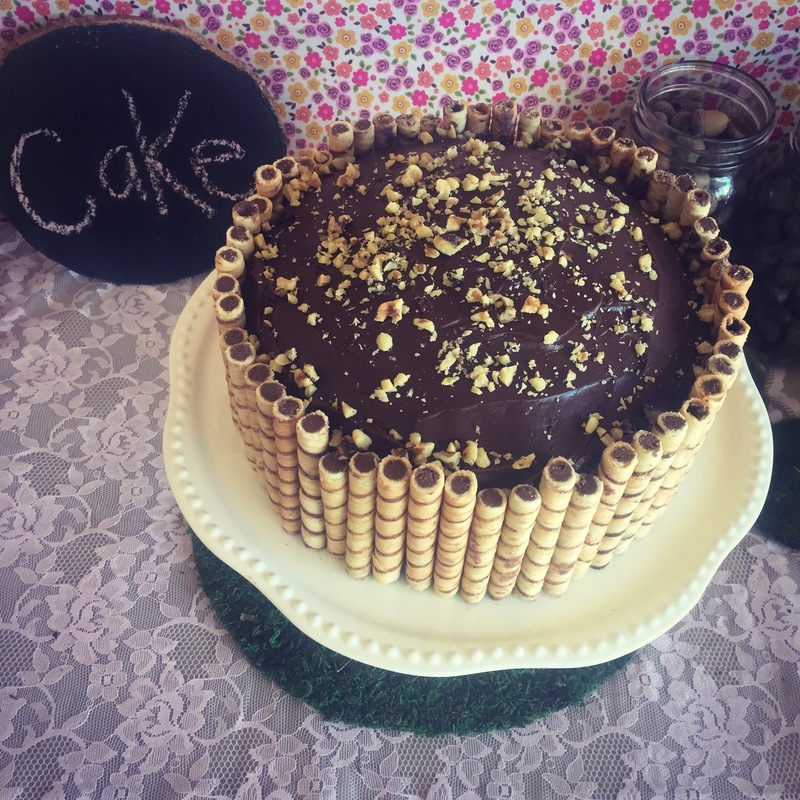 Here are a few more pics- for the cake, I wanted it to be simple but look woodland-y, so I used a box & layered it with cheap frosting & put these pirouette cookies on the sides. 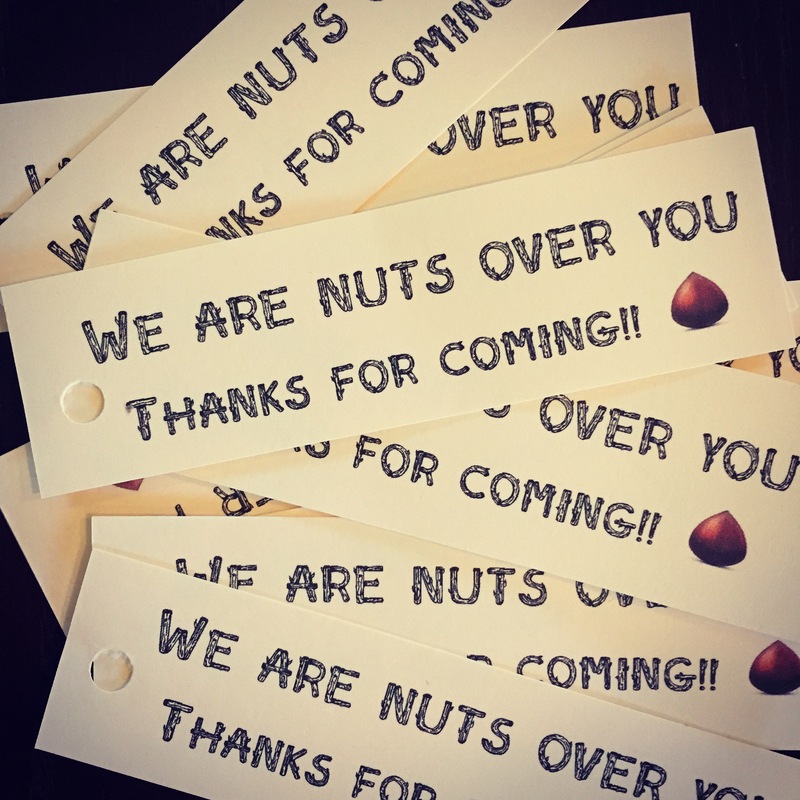 For the favors, I mixed together a little chex mix with some prezel sticks & mixed nuts and printed off some tags. The donuts are meant to look like acorns- that was a really fun activity Ginger (5), Pearl (3) & June (2) all helped with the morning of. 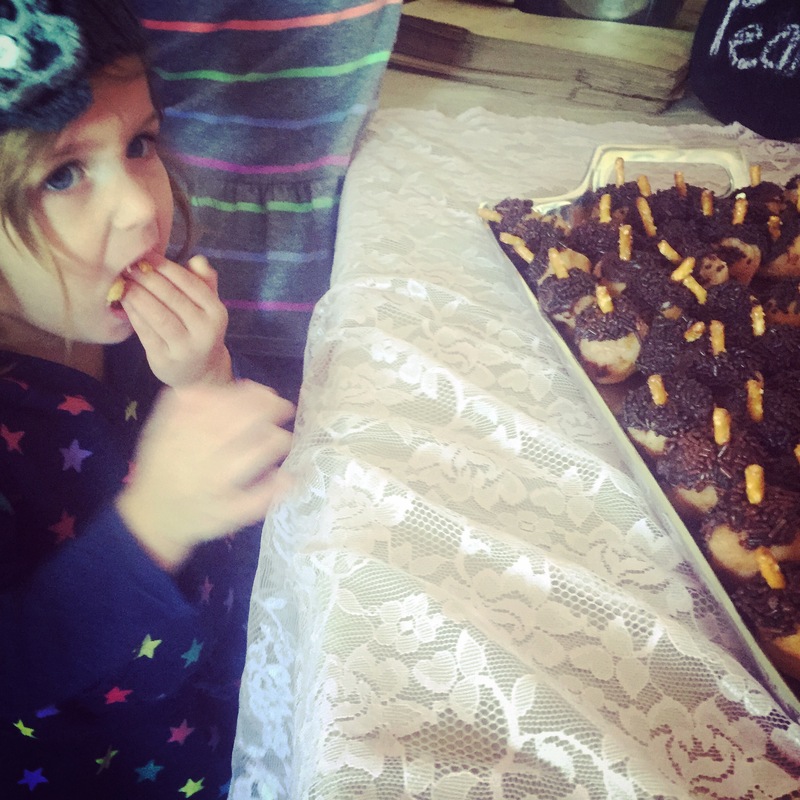 I put the frosting on the ends, they rolled them in sprinkles and dad stuck the pretzel rod in the end. 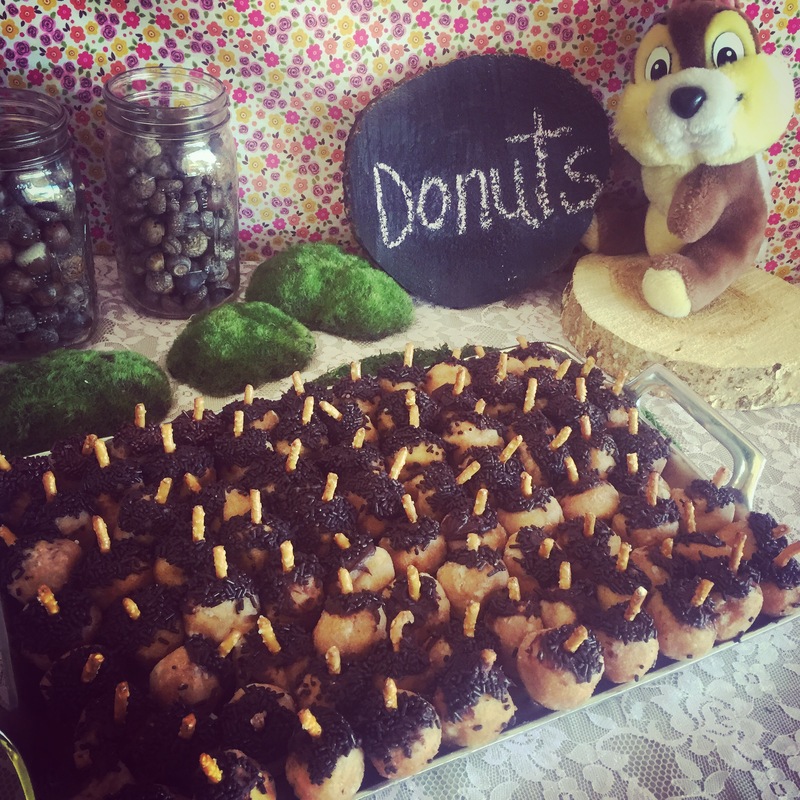 Acorn donuts, because sometimes you need a donut instead of a cupcake. 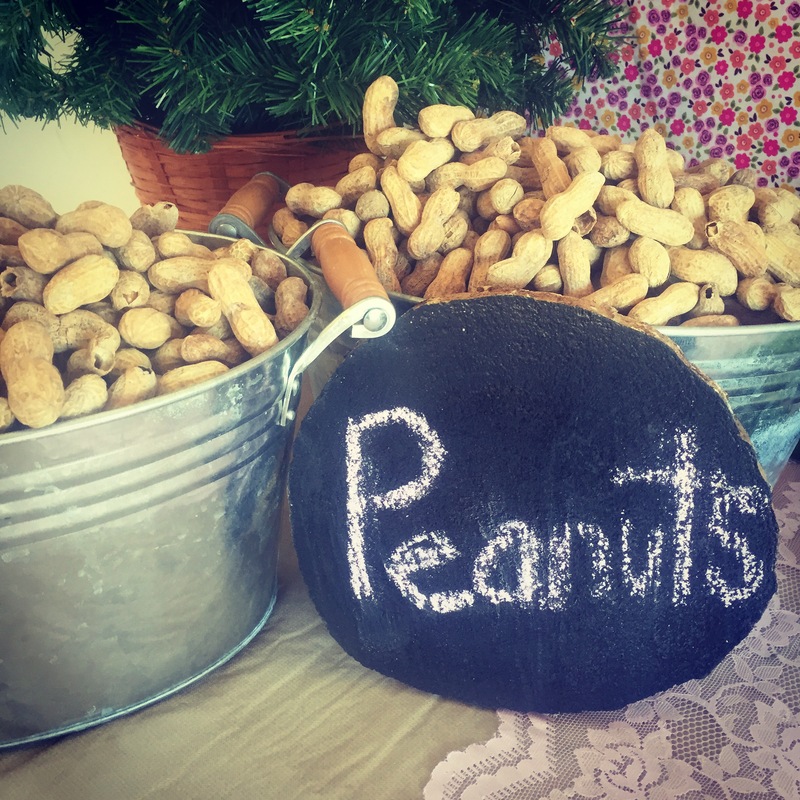 We ordered way too much peanuts, so looks like we’ll be eating those for a while. I handed out brown paper bags and let the kiddos grab a couple handfuls. A friend also gave me these pieces of wood, so I used some old chalkboard paint to liven them up. All in all, it was a blast! And Juney had fun, which made me happy. June may be small, but she can pound a donut hole like nobody’s business. 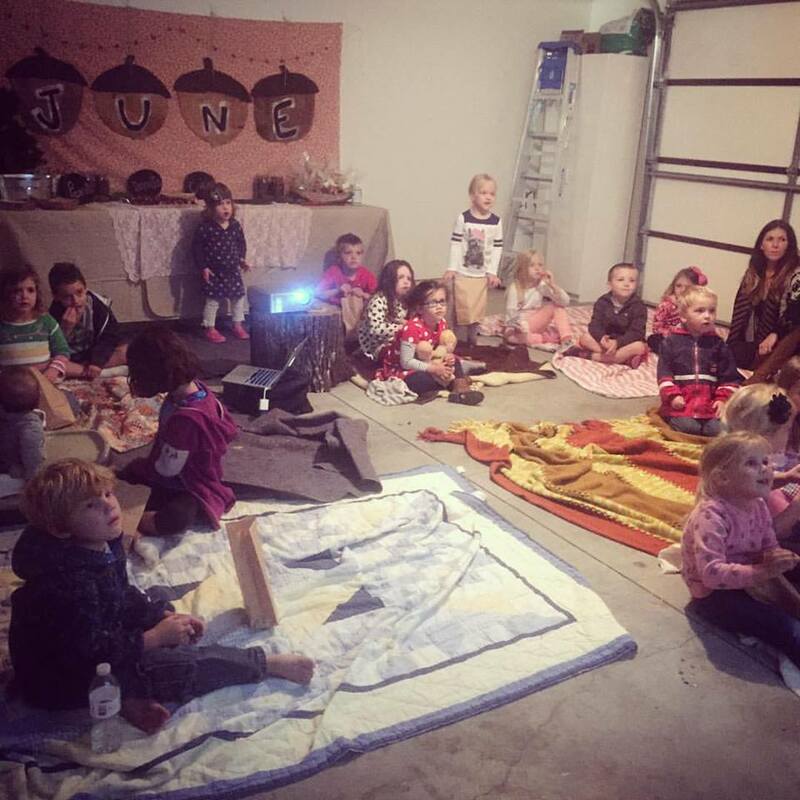 If you’re looking for a fun idea for a birthday party, definitely consider the movie in the garage route. All the little kids sitting on the blankets thinking this was so cool, when it’s seriously just a garage! 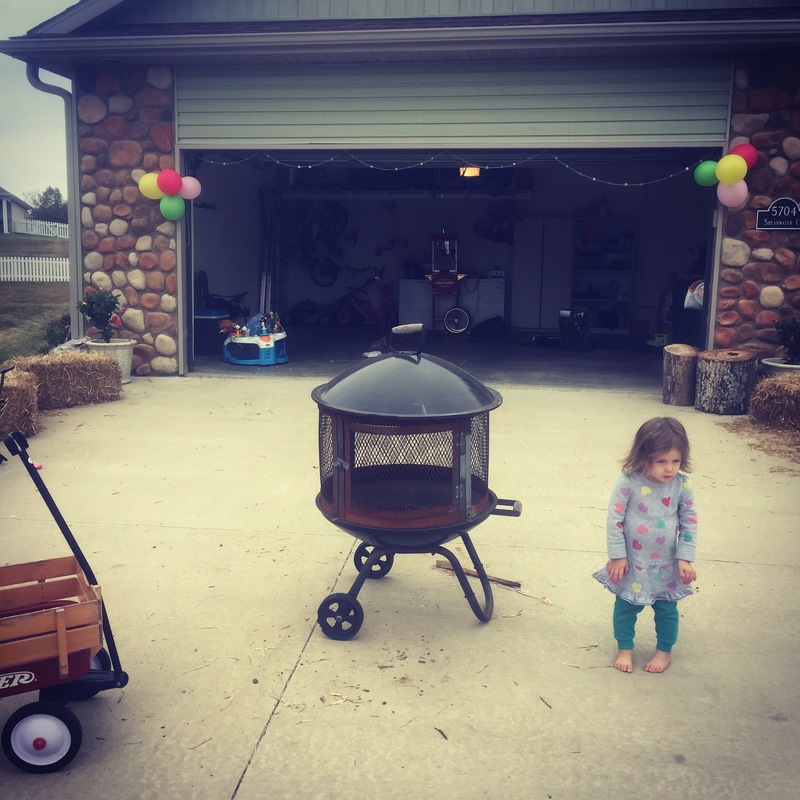 And I wish you could’ve seen the looks on the parents faces as we shut the garage door- all the littles inside and all of them standing there outside eating hot dogs and cake by the fire pit. We were all like, “Why didn’t we think of this before?!? !” HA! 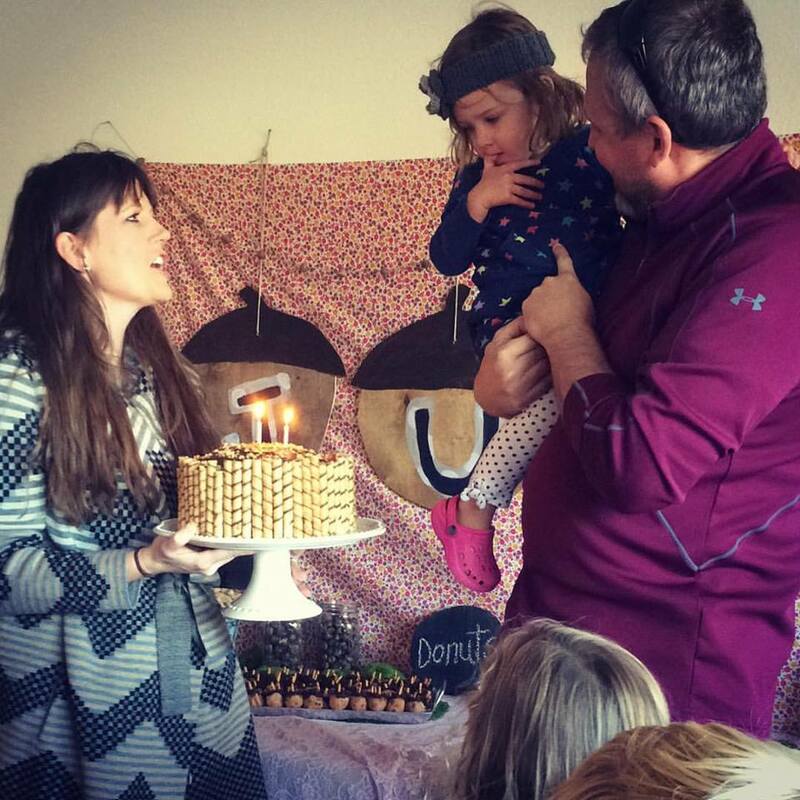 It was one of my favorite parties yet. you guys stayed in the garage during the movie? and all the parents got to hang outside by the fire?? that is an incredible idea!! !